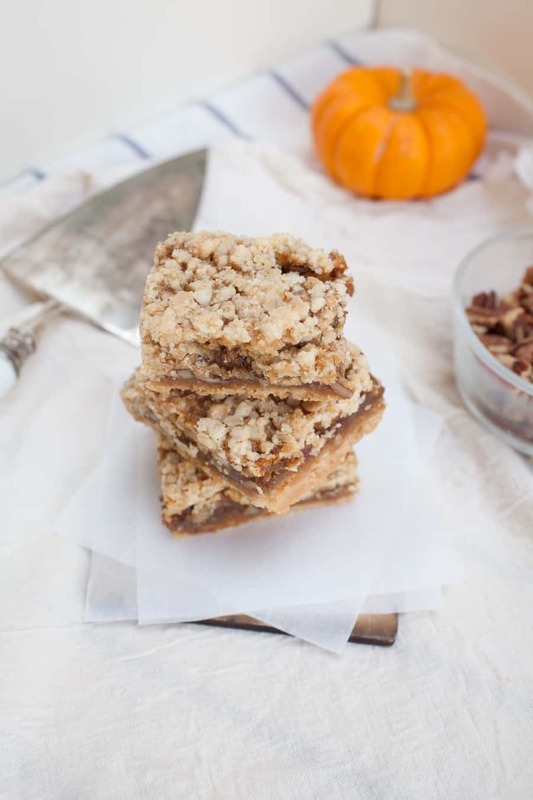 These pecan pie crumble bars are perfect for the holidays or when you need a little holiday spirit any time of the year! These bars have a shortbread pie like crust, gooey pecan pie filling, and the easiest crumble topping. After trying these, you may never need pecan pie again. If you’re not usually a fan of pecan pie, give these pecan pie crumble bars a shot, they just may surprise you! November is here and that means Thanksgiving is just around the corner! Dessert around the holidays has always been my favorite part. Inevitably, every year we all have a hard time choosing between all of our variations of pie. 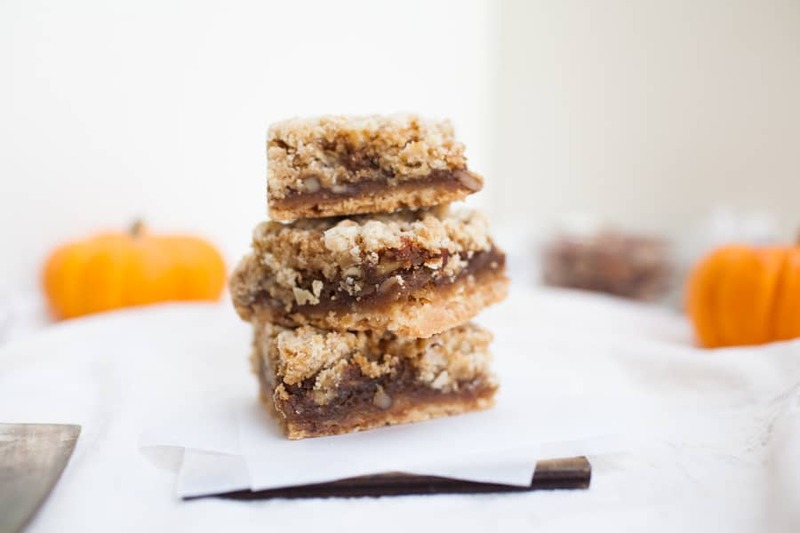 So, this year, we’ll be able to have a slice of pumpkin pie and a pecan pie crumble bar, too! I’m joining my blogging BFFs Susannah from Feast + West and Meghan from Cake ‘n Knife for their third year of Blogsgiving! The idea is based on an old-fashioned potluck dinner party. Each blogger is bringing one or more dishes to the party, so be sure to stop by each one and get some ideas for your own Thanksgiving meal. We’ll be posting to social media with the hashtag #blogsgivingdinner, but you can see the entire menu below in our recipe roundup. Last year I wasn’t able to participate while I was on maternity leave, but this year I was ready to go! I wanted to do something a little different this year since the first year I did family recipes (Grandma’s Pecan Pie and Sausage Stove Top Stuffing). Then the idea for these bars popped into my head. There’s never been a competition for me when it comes to pumpkin pie versus pecan pie. I’ve always gone straight for pumpkin. I had convinced myself that I didn’t like pecan pie at all, though truthfully I’ve only tried it a handful of times. 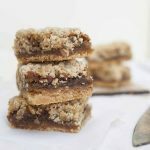 When I made these pecan pie bars, I used the filling from my grandmother’s pecan pie recipe and they looked so good that I just had to try them. You guys, I haven’t been able to stop eating these bars. Usually, I make desserts, eat one and I’m fine. But these bars? I’ve eaten over half of them because I just can’t get enough. My family has already decided that these may just replace our usual pecan pie versus pumpkin pie battle. Because, again, you can totally have both! One of my favorite parts about these bars is the crumb topping. I love pies with crumb toppings and while pecan pies don’t traditionally have a crumb topping, I’m thinking they should from now on. 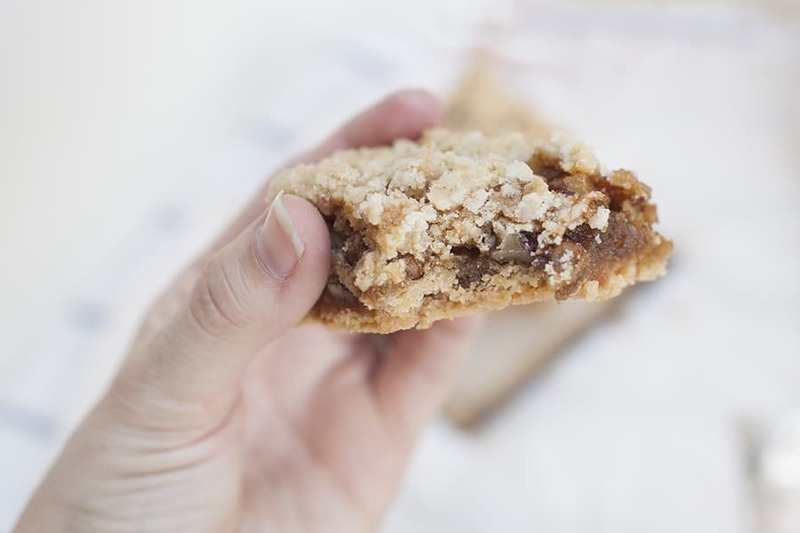 Ever since I made these bars, this crumble topping has become my go to for all the crumb desserts, like peach raspberry crisp, caramel apple crumble muffins, and fall apple crisp. 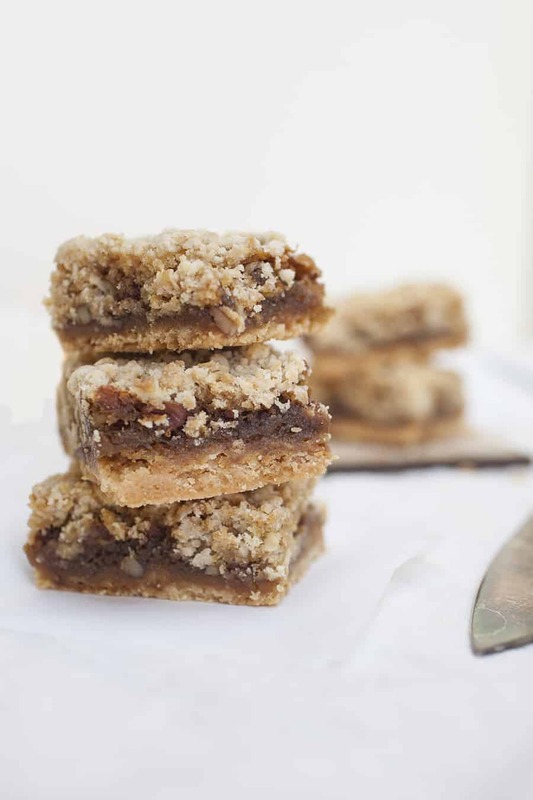 There are a handful of “pecan pie” bar recipes out there, but I think this one truly is my favorite. I hope you’ll give it a shot and maybe it’ll even replace your favorite holiday pie, too! Bake for 20 minutes until edges are just beginning to brown. Pour pecan pie filling into crust immediately. Pour into HOT baking dish after crust has baked for 20 minutes. Oh I love these! I also skip pecan pie for pumpkin but my other half is a die-hard pecan fan so I am coming around. I think I need to try these! How many did one pan make if you cut them the size of those in the picture? I need to make 6 dozen for a cookie exchange and these sound delicious!